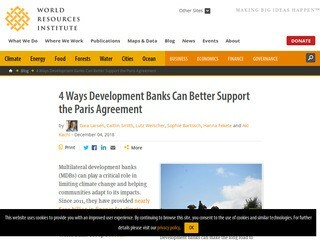 Parties to the Paris Agreement committed to “making finance flows consistent with a pathway towards low GHG emissions and climate-resilient development (Article 2.1c).” It is especially critical that energy-sector infrastructure is Paris aligned, given the large carbon lock-in potential of investments and the scale of investment needed in the coming years in the developing world. 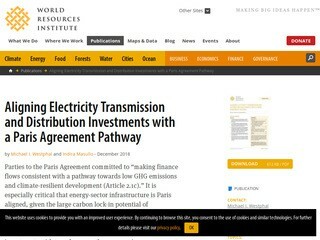 While there have been some recent efforts to assess the alignment of energy-sector investments with two-degree pathways, previous assessments have not seriously delved into electricity transmission and distribution (T&D). 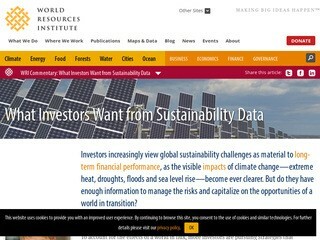 The purpose of this paper is to propose a credible and rigorous methodology for assessing Paris Agreement alignment of T&D investments. Our long-term goal is not only to provide a methodology that can be used to screen investments externally at the project level, but also to mainstream this methodology into development finance institutions’ investment decisions and energy portfolios. 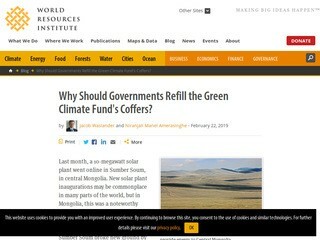 Why Should Governments Refill the Green Climate Fund's Coffers?